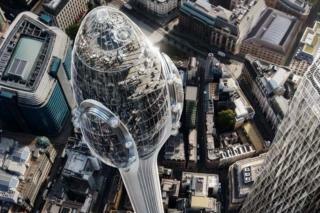 Planners have approved the 1,000ft (305m) Tulip tower proposed for the City of London. The skyscraper would be the second tallest structure in western Europe and feature a viewing platform with rotating pods. City of London Corporation said it was "truly unique" and would help increase the number of people visiting the Square Mile at weekends. The mayor of London will make a final decision about the plan. Greater London Authority (GLA) planners have 14 days to respond and have previously advised they believe the tower failed to follow the London Plan. If approved, the Foster + Partners-designed tower would be built at 20 Bury Street, beside the Gherkin tower. It is set to include a restaurant and sky bar, as well as a floor for education facilities during school hours. Groups including Historic England and Historic Royal Palaces had warned the structure would seriously affect views of the nearby Tower of London. However, planners found that any harm would be "less that substantial" and outweighed by the "benefits" of the proposal. The Corporation's Planning and Transportation Committee backed the plan by 18 votes to seven after conditions were imposed such as restricting ticket sales during peak hours. Committee chairman, Chris Hayward, said the building "has the potential to play an important role in realising our vision of the Square Mile as a vibrant 24/7 city." In addition to the mayor's decision, the secretary of state also has the power to call in the application if they are unhappy with the proposal. Developers previously said they hoped to complete the project in 2025. Reality Check: What are the rules on building skyscrapers?